There are memorable meals, and there are those meals that give us the sensory equivalent of a photographic memory. Every flavor, every texture is etched into vivid memory. The latter was my experience with Cotogna, one of San Francisco’s outstanding boutique Italian cafes. I realize that saying “one of” doesn’t exactly sound like an overwhelming endorsement. Allow me to explain. If you are not from the western U.S. or other major US or international city, then you must understand this Fact 1: San Francisco is a major food city; trying to label something as “THE best of…” is like trying to judge the Miss Universe pageant with a constantly changing lineup when you don’t even know the contestants… Fact 2: San Francisco’s rich Italian immigrant history is often overlooked and underrated (see also my posts about fabulous pizza at Tony’s and Il Casaro). Fact 3: Cotogna is a project from the owners of Quince, a San Francisco culinary landmark (even if it’s been long displaced in the ranks of SF restaurants with a month-long wait list after redeveloping their concept). And now, an opinion: I’ve tried several good Italian restaurants in my short time as a San Francisco resident, but none hold a candle to Cotogna. Cotogna defines its menu as “rustic Italian,” but I believe that is a misnomer. Cotogna’s ingredients may be rustic, but its execution is nothing short of exquisite. Precision and delicacy are perhaps better descriptors. Every bite is one worth savoring, as if you’ve been given the opportunity to sample a museum artifact – a small portion of something you may never see again, because it again may never be replicated. Cotogna’s location itself provides great insight as to its type of establishment. In the farthest northwest reaches of the Financial District, it is a stone’s throw away from the dozens of historied Italian restaurants that demarcate Little Italy, but it’s just southeast of the main tourist drag of Columbus Avenue. In other words, it is a bit too well-heeled (or Tory Burch flat-heavy) to be lumped in with Little Italy, but it has more personality than much of the Financial District. Cotogna is small (typical San Francisco), with perhaps a dozen simple wood tables that glow from the cozy flames burning in the tandem fireplace and pizza oven in the rear. The bar stands opposite and is meant to serve diners, not simply those in search of a cocktail or Italian wine. Consider yourself fortunate if you are able to get a reservation or walk-in seating at the bar. After a windy, rainy El Niño week, Cotogna was a warm Italian embrace. Having snagged seats to dine at the bar with a friend, it turned out to be the perfect location to watch some of the behind the scenes action from Cotogna’s busy and knowledgeable staff. My friend might as well have earned the status of San Francisco native based on her twenty-ish years in the city (sorry to those of you actual SF natives, but compared to many of the tech transplants…). As such, she is no stranger to Cotogna and has both rave reviews and high expectations. She also is a true wine connoisseur in that she knows exactly what she likes but is open to recommendations from the bartender – which serves to keep bartenders on their game! Confession: Italy isn’t one of my favorite regions for wine. I find too many acidic, harshly-oaked reds or simplistic whites to consider them reliable enough to chance ordering (except Prosecco!). But with the help of Stephen, general manager of Cotogna turned bartender for the evening, both of us found a few gems. 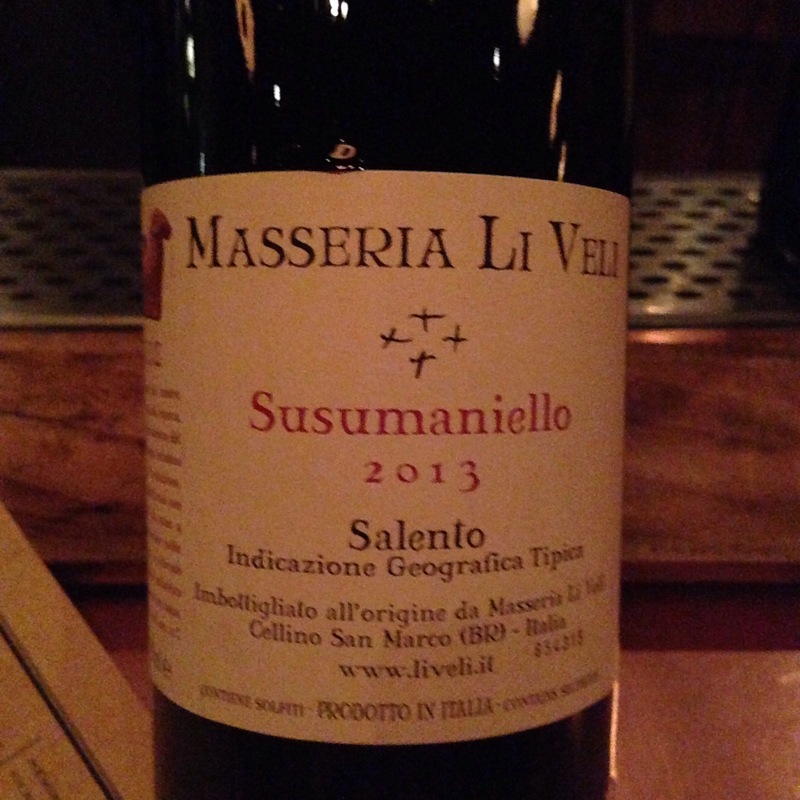 A 2013 Li Veli Susumaniello was my favorite taste of the evening. From the region of Puglia (Apulia) in southeastern Italy, it hails from ancient grapes local to the region. A rare fruit-forward but balanced, medium-bodied red, it didn’t overpower my delicate pasta or starters. My friend and I split two fantastic starters: a burrata con pasticcio del orto and roasted Brussels sprouts al gratin. The burrata (a cream-filled ball of mozzarella) was silky, its liquid center almost indistinguishable from the texture of the exterior. It was topped with a fresh garden vegetable relish that seemed like a more sophisticated, autumn version of giardiniera. Poached chanterelles surrounded the cheese. I rarely see chanterelles cooked any style other than sautéed or roasted, so they appeared a bit ghastly, but they were tender and not overwhelmingly earthy – which was a good fit for the dish. Toasted rustic bread accompanied the cheese – perhaps the only item I tried at Cotogna I’d bother to describe as “rustic”. 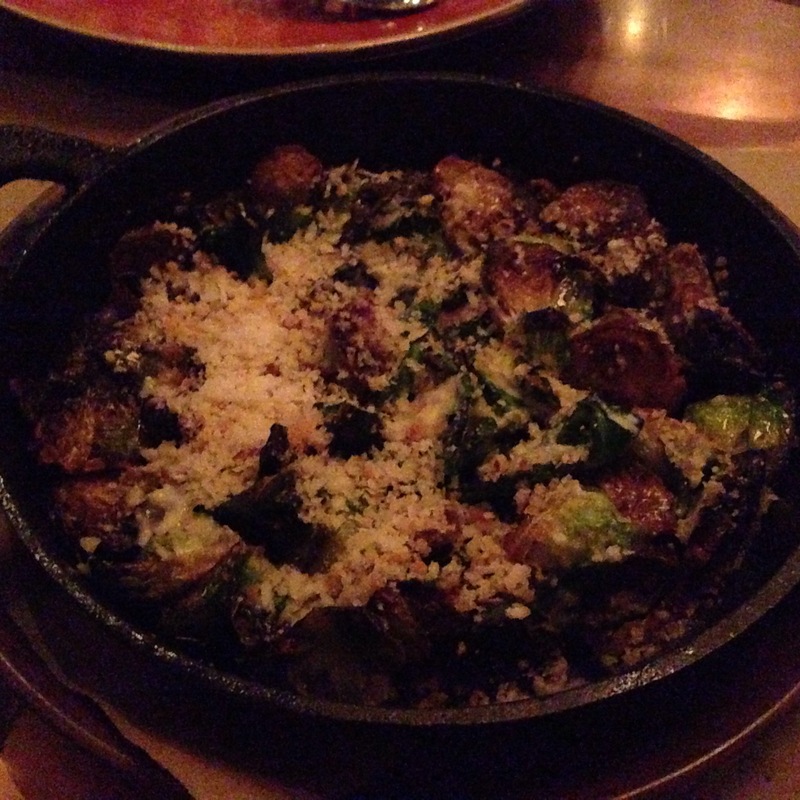 Brussels sprouts are everywhere these days, and I certainly have written about a few incarnations of them over this year in the Culinary Diplomat. I have to recognize Cotogna, though, for a deftly executed rendition. Roasted to perfection and tossed with olive oil, citrus, and Parmesan cheese seemed almost too simple to be that delicious. The earthy vegetable also complimented the burrata dish in a way one would have thought they were – or should have been – paired together. Cotogna’s frequently changing menu follows the traditional Italian “primi piatti”, “secondi piatti”… multi-course concept. Rarely have I ever followed that menu suggestion myself, but luckily, Cotogna suggests, but does not expect, one to do so. Except for its multi-course Sunday suppers! After such robust starters, a single course was enough for me. The category was a no-brainer. Hearing Stephen describe each house-made pasta choice, I quickly decided on a pasta as my main: a tortelli di zucca (it also happened to be the one description I understood without assistance!). 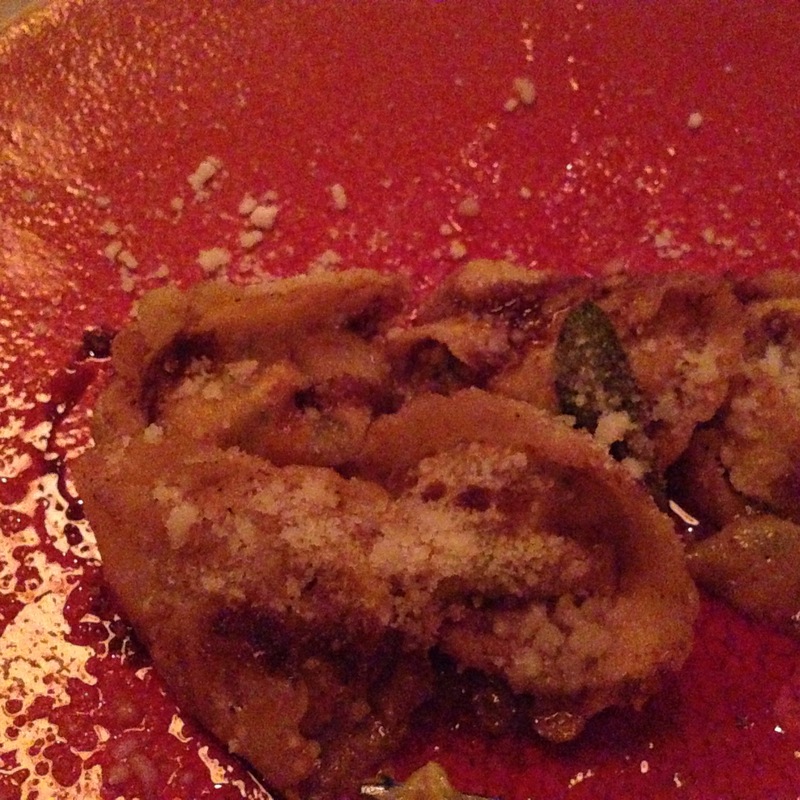 The tortelli – a filled pasta and cousin of tortellini – was filled with squash or pumpkin, sautéed with sage, brown butter, and hazelnuts. If you note the above photo, you might notice the absence of sauce. Rather than swimming (which, for the record, is usually fine by me!) in sauce, the pasta was coated gently. Doing so meant the pasta itself was the solo performers the other flavors were not vocal crutches, but back-up dancers, to use an analogy. The pasta was cooked to a gentle al dente, filled with sweet squash. The caramelized brown butter and chopped nuts mellowed the sweetness, while the sage and a hint of cheese added savory balance. I have tried several pastas around the US with this flavor profile – most notably before in Portland, Oregon – but Cotogna’s was, by far, the best and most true representation of this dish. My friend ordered the black sea bass (listed in English) from the secondi list. I was lucky enough to sample it. 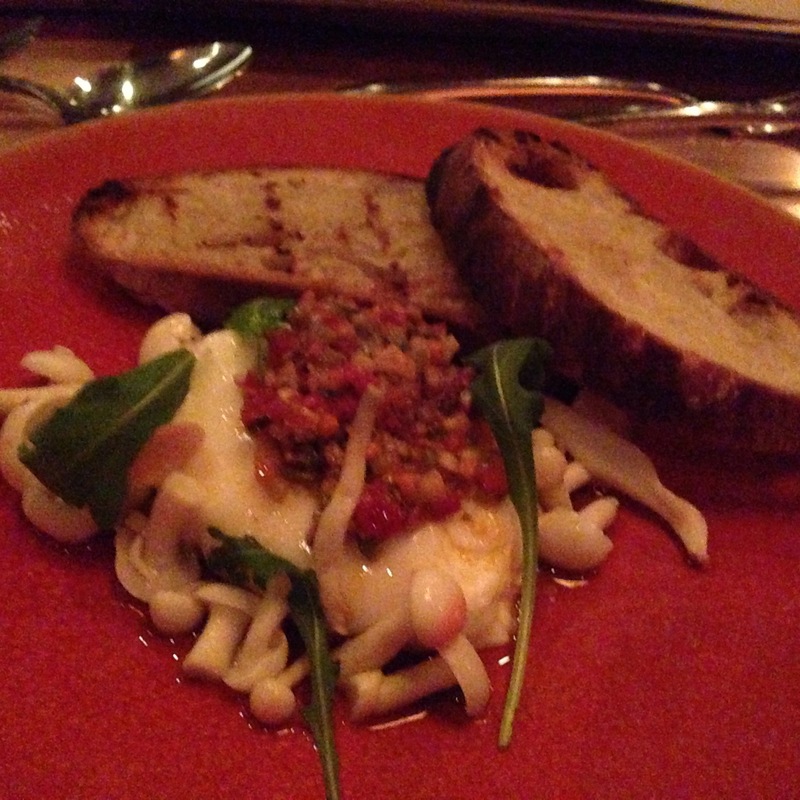 It reminded me of the amazing cod dish I had at Nonna’s Kitchen at Alphonse in Washington, DC earlier this year. That is the highest compliment I can pay any cooked white fish. The bass had a defined but subtle crust and moist interior. 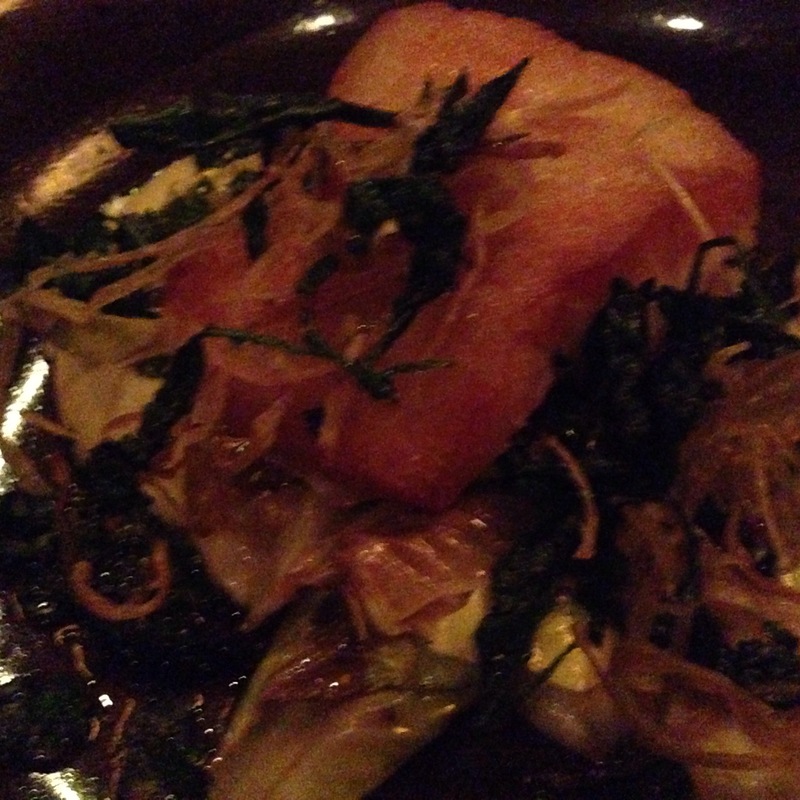 The stewed greens that accompanied it had just enough acidity to harmonize the fish. Had I eaten more than two bites, my endorsement probably would have been more robust, but alas, I was distracted by the foodgasm from my own pasta. Though we had no room for dessert, my friend highly praised the dolci, especially the chocolate budino, and encouraged me to try it someday. Oh, I most certainly will do so – a second visit to Cotogna is definitely on my agenda! Next Post Happy New Year from The Culinary Diplomat!